It’s the final week of the Inspired by Islay club, and we’ve released the final group of patterns. 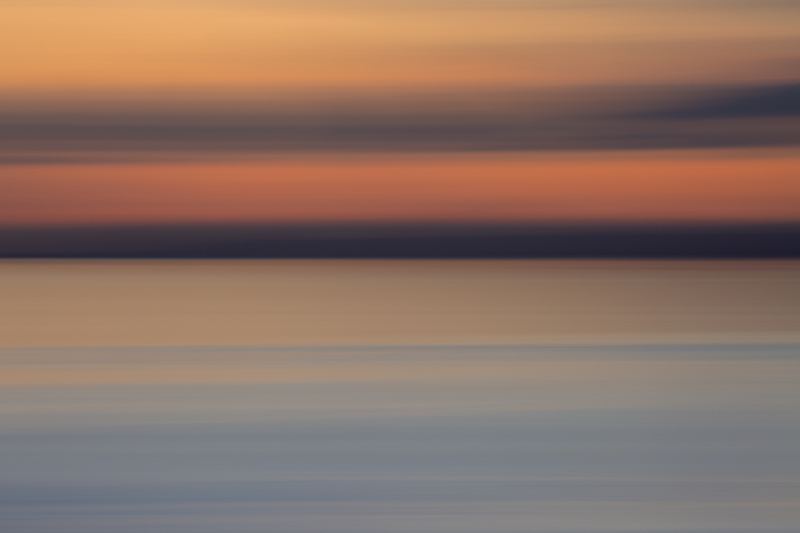 This grouping is is inspired by the beautiful Rhinns of Islay, where the fast-moving skies are never the same from one moment to the next, and are frequently lit up by rainbows. Each of the patterns in this grouping features a rainbow. Last year, when knitting a square for a blanket for my friend Úna’s new baby, I felt very inspired by the collective labour of the gift, with each knitter making their contribution and being represented in the final object in his or her square. So I decided to design a modular blanket for this collection. Each square of the blanket features the same, simple openwork motif, which is knitted over a combination of stockinette and garter stitch in a bright shade of Buachaille. I like a really neat finish on a blanket, so devised a straightforward method of connecting each of the squares in turn, before joining each of the strips together and finishing with i-cord. You’ll find this method fully outlined in a new video tutorial, capably demonstrated by Mel. Many of you know Mel, and if you’ve dealt with her will know just how brilliant she is. I first met her at my Edinburgh knitting group ten years ago, and immediately found a talented creative friend. Since the moment I began making knitting my business, Mel has also been my indispensable right-hand woman and I’m very happy to say that that indispensability is now a permanent state of affairs. Mel is now working with us full time at KDD. A MASSIVE HURRAH FOR MEL! Ahem. The Port Charlotte yoke sweater is the second pattern in the series. I’ve had the idea of a dotted yoke in graded shades on my mind for several years. It was in my list of ideas when I was working on Yokes, but never made the final list as I did not knit a swatch that really pleased me – perhaps the design was just waiting to be knit in Buachaille. The pattern is created with slipped stitches, which only ever use one shade per round, and which create a fantastic textured effect as well as a happy pop of colour. I enjoyed the pattern so much, I used it again on the group’s final pattern, the Sraid a’Chladaich / Shore Street hat. In this part of Islay, the island’s important Gaelic cultural heritage is particularly strong. You can read more about this in the Inspired by Islay book in an essay by Anna MacQuarrie, and this jolly hat is named for the Port Charlotte street on which Anna lived when she was working in Islay. These pictures were taken of Tom pre-beard, but they actually now reflect the currently hairless state of his physiognomy. I do not regret the absence of the beard, but I am very sorry that we had to miss the the Bressay Up Helly Aa due to my ill health last week. But things are improving for me now, and I should be at Edinburgh Yarn Fest a week next Friday together with Tom, Mel, Gordon, and Jen, and the whole Inspired by Islay collection. We’ll be on stand E5 and will be very happy to see you. It occurred to me the other day that we will be attending the show with three more books on our stand than we had this time last year: The Book of Haps, and Shetland Oo, as well as Inspired by Islay. What a busy twelve months it has been. Every project has been incredibly rewarding, but have to say that I’m particularly proud of this one. Beautiful pictures and designs (as ever!) and I particularly enjoy the bright shades of your yarn. I too would love to have details of your gorgeous skirt – it looks stunning with your spotty yoke jumper! Today I received your beautiful Inspired by Islay. It is a treasure. Thank you so much for the gorgeous designs which all your fans have come to expect from you, but the love for this beautiful place rings out on every page. While my husband and I are Americans I can speak for us both when I say we have left our hearts in Scotland. We plan on returning next year for our anniversary and I will be lobbying hard for a trip to Islay. In the past our two night stay on Skye was the highlight of our Scottish adventure. Thank you so much for all the hard work and inspiration you have shared through your designs and writing. This is a gem. Congrats on another successful project. I love the club format used for your books & yarn and I am very motivated to plan a trip in the future to visit the beautiful locations Tom photographs and you describe so beautifully. You and your team are inspirational! Kate, Islay has been a lovely format for both me (in Switzerland) and my best friend (in England) – I gave it to her as a combined Christmas/birthday present because it’s her birthday next week, so it’s a gift that has meant extended giving since December! A really good way to savour everything; usually even the nicest new book is soon looked through, even if you go back and knit from it. I particularly enjoy all the extra info on history and geography that you always do so well and even my non-knitter but single malt collector husband was able to join in! Thankyou to all the team! Oh such beautiful designs. Really looking forward to visiting your stall at EYF and seeing some of your gorgeous samples (and the yarn!). The new shade Moonlicht nicht btw is beautiful. 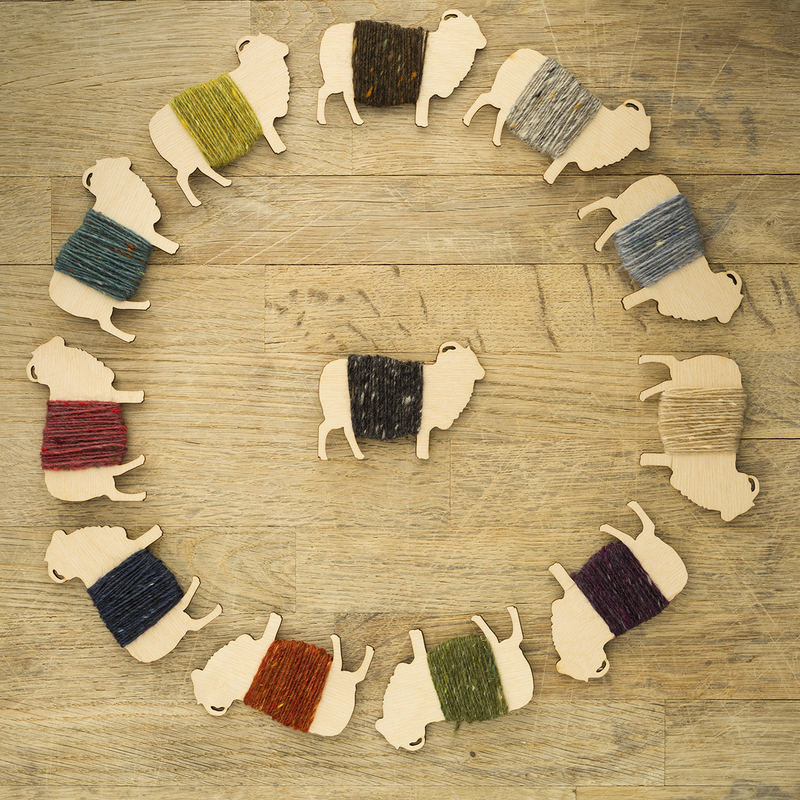 Lovely collection, fits the yarn and the landscape perfectly. I have enjoyed the weekly emails and am looking forward to the book. Hope you’re feeling better and up to Edinburgh next week – I shall whizz past to grab my dark blue yarn and *try* not to buy more. Can Inspired By Inslay still be purchased? I’d love a copy. The colors are gorgeous and just like the scenery. And I love Tom’s beardless look! Hello, I try to buy the explanations of the model of cover(blanket) BIRLINN – but I do not find where and how to buy him(it)? I am French, and I do not speak English. Thank you for indicating me how obtaining the explanations.. Le livre sera disponible le 11 mars. Tom, I thought your beard was terrific! And what pattern is Mel sporting in her orange sweater? Kate,iIt has been a pleasure and inspiration to see your business grow, gain color and woolly substance, and staff. Long may your happiness and success continue. Meanwhile, I have enjoyed your posts for several years. And those irregular missives from Bruce. I like to think that LOVE of wool inspires an intangible and invisible bond in the tactile world. I really love your designs an dphotos and blogs and I wondered if you book, Inspired by Islay, will be available for purchase for non-members of the Islay club soon? Hi Olga, yes, it will be available once we have finished shipping to club members – hopefully by 11th March. I hope you feel much better today. Such a happy and positive rainbow to finish your book….the patterns for Inspired by Islay have all been intriguing and very elegant in design and structure. Lovely work indeed. Sorry you missed the festival. You will have it to look forward to next year! Thank you so much for “Inspired by Islay”! Is it too late to join and receive the book and e-patterns? I love these rainbow patterns, and I can’t wait to get my book in the mail! This was only my second time participating in a pattern club, and I’m so glad I asked for the club for my birthday! I usually don’t want to buy patterns before knowing what they will be, but I knew I could trust you to present me with patterns I would like – and I was right! I’m going to have a hard time deciding which one to start with when I finish the cardigan that has been on my needles since early January. This club has been so inspiring, so much fun. I love all the dialogue, history plus tasting notes. Way more than just patterns. Thank you for helping me through a rough and very rainy winter. Yay- congrats to Mel and the team! That was just the best news, Mel on board, so to speak!! Be well and know that your books and thoughts are always with me. Working on the Deco sweater for my daughter with some handspun. It will be lovely, thank you. The Birlinn blanket is really beautiful. Definitely an heirloom item. And congratulations to Mel! Lovely designs, the blanket is outstanding in particular. All so super, just keep going and enjoying it all! Sorry you’ve been poorly but glad you’re on the mend now and I’m looking forward to meeting you in Edinburgh next week. I love Birlinn and look forward to putting it in my queue along with so many other of your designs. The weekly notes from you and Tom have been the rays of sunshine in this winter of unusual snowfall in Vancouver, BC. We have just this hour decided to visit Scotland later on in the spring and we have a few days to firm up our dates. Islay is definitely on the list with Scotch and yarn “tasting” for us both. Just looking at the photos of the beautiful modular shawl made me so happy! It’s a wonderful pattern. I’m looking forward to getting the book soon. I wanted to thank you and your team for this very very great collection from/about Islay and that I was able to be part of the club. I really liked your newsletters (every Friday something nice to read along with the coffee!). 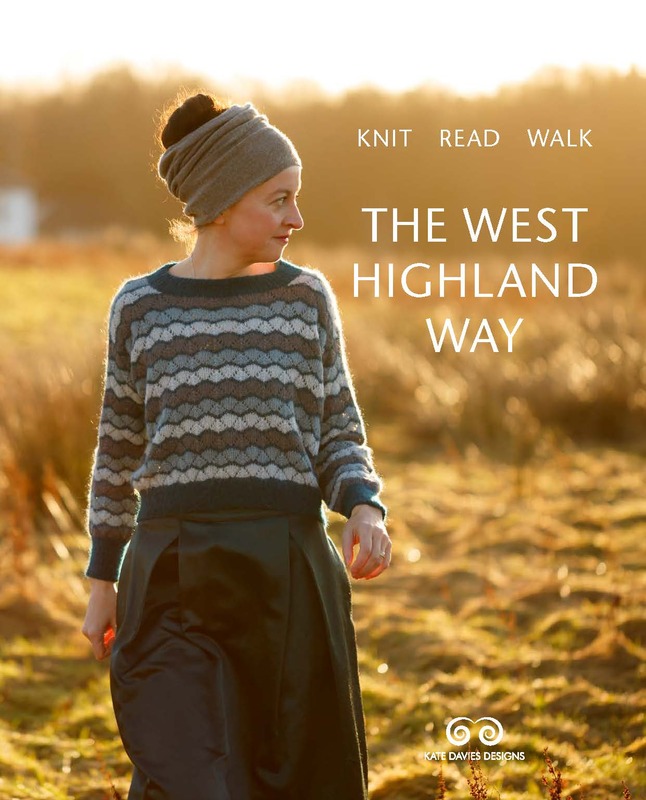 Really inspiring, not only for knitting, moreover to plan a trip to Islay and surroundings! I hope to visit soon, then I will have already a nice and small guide what to see and visit. Especially I also liked the whisky recommendations and I´m glad you are giving us a pdf with only that for “take away”. After week 7 I prepared something similar for a friends birthday together with a bottle of Laphroaighs Quarter Cask (hard to get anything else around). He was very pleased and keen to read your newsletters, too. I was taking also advantage of the discount and I´m now a proud owner of a couple of books from you, which I like way more than to have just the pdf´s in my ravelry. I can´t wait to finally knit one of your designs! All the best for you all, your health and for your future! Oh no, another for my list. I want to knit them all but I think the Oa has to come first or maybe a hap, or Port Charlotte or Kildalton. Discovering this website might mean my house never gets cleaned again. So glad you are feeling better Kate. Take care of yourself. You should be “proud of this one”. Islay book is mind blowing on so many fronts: the articles, photographs and the incredible patterns. Every pattern we want to knit , it has blown our minds with the delight of it all. Of course this book will also encourage people to go to Islay; just as your Oa book encourages as to go to Shetland Islands, which is good for their economics. No wonder you won Microbusiness of the year! Thank you so much for the hard work you have put in these 18 months for us. It has and will give us so much pleasure. PS :Please do Buchaille in a purple or mauve colour! Great news that Mel will be working full time with you! Such a shame that you had to miss Bressay, hope that your health continues to improve. The Inspired by Islay patterns have been amazing!